Experience the urban chic Crowne Plaza Orlando Downtown,perfectly located with easy access to all downtown entertainment venues such as Amway Center home of the Orlando Magic and the new Dr. Phillip's Center for the Performing Arts. Enjoy the convenience of Dollar Rental Car located in the lobby. Explore Orlando's famous parks: Universal Studios, Sea World Orlando and Walt Disney World. Theme Parks only 15 miles away. The Crowne Plaza Orlando Downtown is four miles from the Orlando Executive Airport (ORL), fabulous shopping, and a vast array of restaurants and nightclubs. We are 13 miles from the Orlando International Airport (MCO) and 10 miles to the Orange County Convention Center and we are only blocks from Camping World Stadium home of the Buffalo Wild Wings Bowl, AutoNation Cure Bowl,the Russell Athletic Bowl and the Florida Classic. 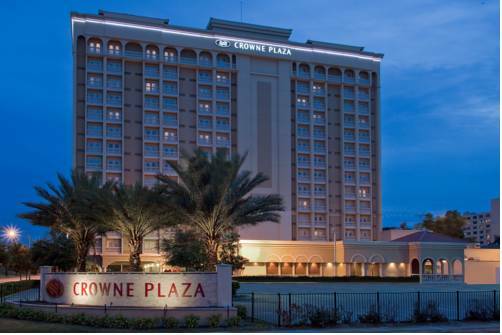 Known as The Place to Meet, the Crowne Plaza Orlando Downtown is a premier venue for meetings and groups, and is located close to industry leaders such as Sun Trust, Wells Fargo, HD Supply, Orange County Courthouse, FAMU Law School, and Orlando Regional Medical Center. We are proud to be a Green Lodging hotel and our staff looks forward to providing the ultimate in service. We are a 100% non-smoking hotel. Excellent space for meeting on one side of the room and feeding the group on the other. Up to 175 people on each side. No pillars or obstuctions, great pre function space. Wonderful and creative menus with below competitive pricing. A grand view of Orlando from the top floor of the hotel, can be your backdrop to your event. A perfect ground floor event space, featuring 1,200 sq. ft. of flexible space with plantation style shutters to allow natural daylight shine on your event. An elegant & sophisticated boardroom. Featuring a 50" TV, built in table top power ports & direct connect for Video to the wall mounted TV. Executive style leather chairs will ensure you are comfortable during your meetings in our Highland Boardroom. Orlando Fashion Square Mall is anchored by JC Penney, Sears, Gayfers and Burdines. You'll also find more than 165 specialty stores, including Mayors Jewelers. Also, visit the Food Court. It houses such eateries as Panda Express, Nature's Table, & Sbarro. Minutes from downtown, this course features the oldest public layout in the area, renovated in 2008. Golfers are treated to the same beautiful scenery & challenges of the original course, including narrow fairways & heavily bunkered, style greens. This theatre/concert hall features continental style seating for 2518. It's excellent acoustics and sound capabilities make it ideal for concerts, Broadway presentations, the Symphony, Ballet and Opera as well as a business conference or general session. Church Street in downtown Orlando is the nightclub & restaurant district . Some of the most popular clubs in Orlando are here, as Chillers , Big Belly, Latitudes, & Antigua. Other bars, like Tabu & Firestone, are just off of Church Street on Orange Ave. The mall is located at the corner of E Colonial Dr & Maguire Ave near downtown Orlando. The 1.1 million-square-foot mall's anchor tenants include Macy's, Dillards, J.C. Penney and Sears,American Eagle, Limited & Victoria's Secret and a movie theater. Hard Rock Cafe Orlando. Located at Universal Studios in the CityWalk complex, Hard Rock Cafe Orlando is the biggest HRC in the world. it boasts more pieces of rock 'n' roll memorabilia than any other location. Come on down when you wanna rock! The I-Drive offers over 150 restaurants & Universal Studios & Islands of Adventure, SeaWorld & Aquatica, Discovery Cove & Wet'n Wild . Also, located on I-Drive are Pointe Orlando, WonderWorks, Fun Spot, Ripley's Believe It Or Not & Pirate's Mini Golf. The largest outlet shopping destination in the Southeast . 175 luxury brand-name outlet stores including Saks Fifth Avenue , Neiman Marcus , Victorias Secret , Baccarat/Lalique ,7 for All Mankind. a sit-down restaurants and a spa. Universals Islands of Adventure , where the world's most cutting edge rides, shows and interactive attractions bring your favorite stories, myths, cartoons, comic book heroes and children's tales to life. The 200 acres of attractions & animal shows make this a perennial favorite with Florida visitors. new attractions and rides have been added to the original fun including a laser-fireworks-water extravaganza & high-tech thrill rides. The largest vacation resort and most popular tourist destination in the world,with four theme parks, two water parks, a shopping and entertainment complex, eight golf courses, and miles of recreational activities. Kennedy Space Center Visitor Complex. NASA's launch headquarters is the only place on Earth where you can tour launch areas, meet a veteran astronaut, see giant rockets, train in spaceflight simulators, and even view a launch. Experience up-close encounters with amazing animals, take an unforgettable safari across the Serengeti Plains, test your courage on pulse-pounding coasters, or catch live entertainment all year long. Dr. Phillips Center for the Performing Arts is a performing arts center in Downtown Orlando, Florida, United States. It replaced the Bob Carr Performing Arts Centre, now renamed the Bob Carr Theater, originally built in 1926.